"Day At Sea". That means M/S Ryndam never docked, and we spent the entire day at sea. Ocean, actually. 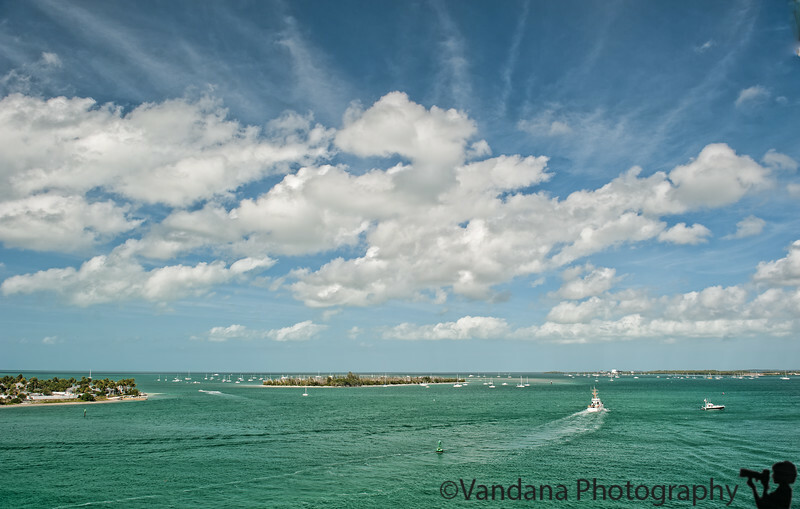 Well, what happened was, the Ryndam arrived close to Key West pier around noon, but we couldn't dock. It was supposedly quite windy...some 20 knots or so, instead of the expected 10 knots. So the captain tried a couple of tricks to dock, and we all watched excitedly from the deck. But after an hour, he gave up and announced on the P/A system that Sorry, its too windy, we can't dock in Key West, so we set sail right away to Cozumel, Mexico. But no worries, the cruise director will come up with a full day's worth of exciting activities to keep us amused! After some 10 minutes, the cruise entertainment director read out a bunch of very entertaining ideas, like "Boys vs Girls bingo" !!! Had we docked, we would now be on a "Glass Bottom Boat tour" of the coral reefs at Key West, but here we were stuck with the bingo crowd. We spent the rest of the day checking out the ship, lying on the deck chairs on the rooftop deck , while the ship's DJ belted out some rocking numbers from the 70s. We sampled ice creams from the Lido, pizzas from the Terrace Grill, went to the art gallery, and capped out the night with a viewing of the very tragic british drama "One Day", playing at the Wajang Theater on the 7th floor of the Ryndam. Nice, completely unexpected, lazy day. What a shame you missed Key West... it's fantastic. It sounds like you had plenty of options for things to do though. Hope you are enjoying some nice weather, great food and taking some great photographs. Have a wonderful holiday! Sounds like a pretty fun day! Beautiful shot. Sometimes an unexpected lazy day can be a good thing. Looks like a fabulous location to be on vacation! Sorry you didn't get to do the glass floor boat tour. That sounds like it would have been a lot of fun.